I've got two to discuss, both new releases on DVD this week. First up is "Sherlock Holmes". Now I've long been a fan of the original Basil Rathbone 1930's and 40's Sherlock Holmes movies. They're classic sunday afternoon fayre which are perfect for whiling away an hour or so of pouring rain and travelling back in time to a much simpler crowd of criminals. Rathbone made 14 of them (that I know of) between 1939 and 1946 with his faithful sidekick Dr.Watson as portrayed by Nigel Bruce. 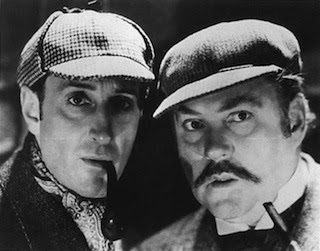 What was particularly wonderful about them is the way that the makers took Holmes & Watson, who are instantly recognisable as the Baker Street crime fighters that we know and love, and then crowbarred them into joining the war effort battling against spies and thieves who were quite often working for Nazi Germany in some form or another. This type of propaganda was not unusual in movies of the period and in this case it just seems to fit into the correct place in history. Transposed from the 1800's into the 1940's works beautifully and you'd hardly expect them to be anywhere else. This brings us to the new version of Sherlock Holmes as directed by Guy-"Lock, Stock & Two Smoking Madonna's"-Ritchie. Mr Ritchie has managed to bag man-of-the-moment fresh from his triumphant return to cinema via Iron-Man (2007), Robert Downey Jr. Mr Jr. had disappeared under a bit of a cloud of drug fuelled nonsense during the 90's - and whether any of what was reported about him is true - I couldn't care less. I am glad to see him back and he's proved himself an entertaining actor time and time again. Alongside Mr Jr is our great british actor Jude Law who's well known for all sorts of interesting movies of repute. Enough background and Bio stuff, what about the film??? Of immediate notice to a Sherlock Holmes fan of old is that this most definetly ain't that. In fact far far far from it. Second thing of note is this is the only film I can remember to make effective use of the word 'discombobulate' within the first 15 minutes. So why is it so far from Mr Rathbone and Mr Bruce? ... Perhaps it should be called "Lock, Stock & One Smoking Detective". It's Jam packed with Ritchie-isms, from fast paced edits, to slow-mo punchups, retrospective rewinds and vista-loving-long-pans. Now I've heard Mr Kermode's opinion of it, and I wholeheartedly concur. It's a great movie and as long as you keep Guy Ritchie away from the story and/or script, he's a great filmmaker. My only criticism, and it is a fairly lightweight one, is that of geographical misrepresentation of the capital city. It's a small niggle though and one that doesn't detract from the overall experience unless you worry about these things like I do. Geography (and History for that matter) aside, the story is convincing enough to be a Holmes & Watson and although it's clearly not penned by Sir Arthur it breathes new life into two well honed characters who surely have to come back for a second outing. The on-screen relationship between Junior & Law is everything you could want in a buddy movie which just makes it infinitely watchable. Financially it performed well and Warner Brothers must be champing at the bit. Back in March, the very question of a second was put to Mr Law. And His response? "I think we are probably going to make another one," he finally said, "I haven't been given the absolute... it's not like next week but I think it's sometime this year is what I get." ...and rumour has it that both Paris and Switzerland are on the list for the reprise. I doubt there will be 14 Junior, Law & Ritchie efforts, but if they can maintain the up-beat, action-filled, smile-a-minute quality of the first throughout another 13, I'll greet every one of them with open arms and my £7.50 cinema ticket. 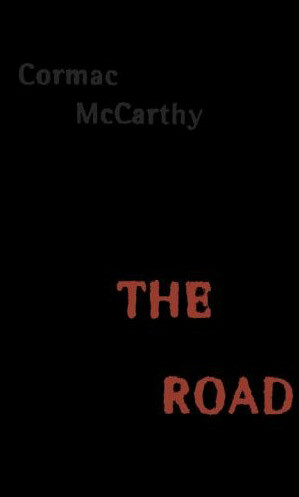 Second one to get a shufty, is "The Road" based on the novel by Cormac McCarthy (He of "No Country For Old Men"). From a story point of view, could it be any more juxtaposed to Sherlock Holmes? Probably not. It says here that it's "a father and son journeying together across a grim post-apocalyptic landscape, some years after a great, unexplained cataclysm has destroyed civilization and almost all life on Earth. Realizing that they will not survive another winter in their unspecified original location, the father leads the boy south, through a desolate American landscape along a vacant highway, towards the sea, sustained only by the vague hope of finding warmth and more "good people" like them, and carrying with them only what is on their backs and what will fit into a damaged supermarket cart." The opening scenes are dark and worrying and in fact I expect the whole movie to be like this, but alas, it was too late at night for me to see it in full, so I'll finish it off tonight and give you my considered thoughts in the morning. In the mean time, go and rent Sherlock Holmes and have a great night in.